SUBANG: Andaman Property Management Sdn Bhd (APM), which is currently building and managing 10 ongoing property projects locally, aims to be the country's leading property management and property related services company. Its executive director (sales and marketing) Datuk Vincent Tiew said from Jan 2011 onwards, the company would be launching and managing at least 10 properties worth RM2bil simultaneously. Tiew said of 10 projects it currently managed, four belongs to the Andaman group. “And we anticipate more developers and landowners to request for our services this year,” Tiew told StarBiz, adding that APM's business model was to develop and manage properties while generating high yield and fast turnaround for developers and landowners. APM was formed in 2009 by some of the management members of the Andaman Group, an established property developer. “After honing their skills in property development and managing properties of the Andaman Group, they decided to form an independent company, which is how APM was incorporated,” Tiew noted. He said when APM was given the go-ahead to develop and manage a property project, it would first be looking to fulfill the developers expectation of the property project in terms of commercial reality, yield, bottom line. “And our work starts from the onset of planning, authority management, construction and building maintenance to units selling, project administration and securing of strata-title. We also provide developers and landowners advice on how to best position the property development in terms of architectural design and other value-added services in line with developers/landowners expectations,” Tiew said. APM targeted its properties at the mass market to ensure that they remain in demand, even during the downturn, Tiew said, adding that for certain properties, buyers were guaranteed with return on investment. APM's current property projects for the Andaman Group include Kota D'Sara with gross development value (GDV) of RM125mil, and Casa Residenza (GDV: RM180mil), both located in Kota Damansara. APM plans to launch the The Academia@South City Plaza in Seri Kembangan and the RM700mil The Arc@Cyberjaya in Cyberjaya. 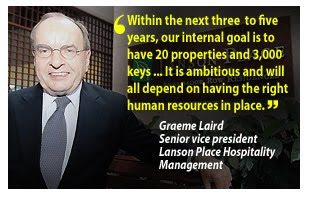 LANSON Place Hospitality Management Ltd will operate a RM207 million property known as Lanson Place Bukit Ceylon Residences in Kuala Lumpur in 2012. This will be Lanson Place's third property in Malaysia and form part of the Verticas Residenci development in Bukit Ceylon by Wing Tai Malaysia Bhd. The tower, to be managed by Lanson Place, is owned by Wing Tai Malaysia and Lanson Place's parent company, Wing Tai Properties Ltd. Wing Tai Properties is listed on the Hong Kong Stock Exchange. The management company's senior vice-president Graeme Laird described the upcoming accommodation as "comfortable and chic" and said that it would have 150 keys with one- to three-bedroom units. The property has set new standards in the serviced apartments as it has very large units, with a one- bedroom unit measuring 1,100 sq ft and larger ones reaching 2,000 sq ft. When asked about return on investment for this property, Laird said: " We did not calculate the payback period. The expected gross rental yield in a stabilised year could reach more than 10 per cent. So this would be from year three of operation." 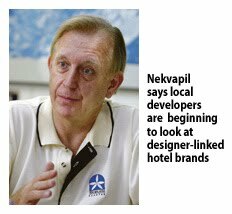 The Bukit Ceylon property hopes to garner an average of RM500 per night when it opens. Meanwhile, its four-star Lanson Place Ambassador Row with 221 keys closed last year with an average room rate of RM207 and an occupancy of 72 per cent. This year, it hopes to garner RM250 and fill 70 per cent of its room inventory. It also operates 132 units in Lanson Place Kondominium No 8, which consists of purely residential apartments. 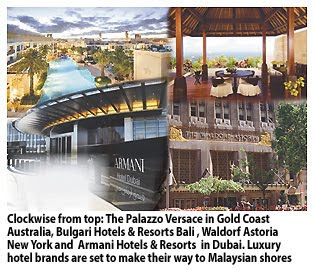 Where next in Malaysia for Lanson Place? Laird said it could be keen on Penang and Kota Kinabalu in Sabah if the right properties become available and the destinations can support high-end serviced apartments. But its more immediate priority is to upgrade Lanson Place Ambassador Row in 2013 to lift the product and position it further up- market. BINA Puri Holdings Bhd, which is expanding its business, is bullish that revenue will surpass RM1 billion this year, its chief said. "This year is all about execution of projects and finishing existing jobs. We expect 2011 to be one of our better years since our listing in 1995," group managing director Tan Sri Tee Hock Seng told Business Times. In 2010, Bina Puri secured projects worth RM2.5 billion. Among the contracts it won were the Ampang light rail transit line extension, the low-cost carrier terminal in Sepang, the Kuala Lumpur-Kuala Selangor Expressway privatisation project and building ramps and a main line bridge for the Eastern Dispersal Link in Johor. The company hopes to maintain the rate of new contracts this year by securing RM2.5 billion worth of work. It has bid for building and infrastructure projects worth over RM2 billion, in Malaysia, Thailand, Brunei and the Middle East. For the nine months ended September 30 2010, Bina Puri posted a net profit of RM8.13 million on revenue of RM861 million. In 2009, Bina Puri made RM6.4 million on revenue of RM780.1 million. Tee said the company's order book of RM3.3 billion will help improve its earnings for the next two to three years. Meanwhile, Tee said Bina Puri is on a drive to expand its property division, which contributes less than 10 per cent to its revenue and net profit. Bina Puri ventured into property development in the 1980sas a boutique developer. Some of its prime projects include Bukit Idaman township in Selayang and Jesselton Condominium in Kota Kinabalu, Sabah. Tee expects contribution from the division this year to be in the region of 15 per cent with RM900 million worth of housing projects in Klang Valley, Johor and Sabah. "We want to expand the division because of the higher margins that can be made from property development. We don't want to be too dependent on construction, which is harder to take on," Tee said.